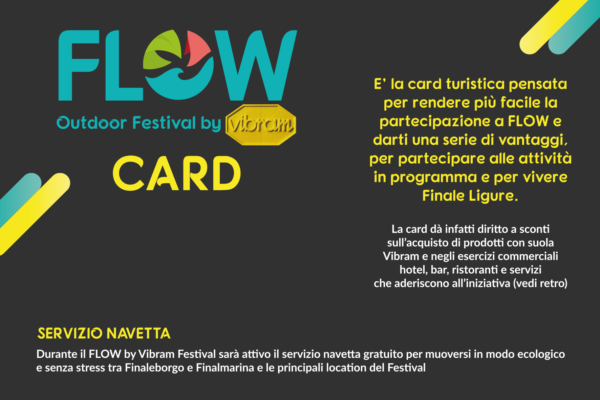 ‘FLOW by Vibram Card’ is a tourist card that helps you enjoy a lot of discounts and extra services during the days of the festival and beyond. Don’t forget that during the days of FLOW by Vibram Festival a free shuttle will also be at hand, the most eco-friendly way to move with no stress between Finalborgo / Finalmarina and the main spots of the event. FLOW by Vibram Card costs 10 euros and can be purchased at FLOW INFO POINTS, at retail stores who have joined the initiative and all tourist offices.